In the history of the auto industry, China is a latecomer, although it became the world's largest auto market in the last two years. Now the country is gearing up to take the lead in at least one field of the auto industry's future: the electric vehicle (EV). Although these eco-friendly vehicles are rarely seen on the road—only about 10,000 in the country—the EV industry has already sprouted in China. Data from the Ministry of Industry and Information Technology (MIIT) show as of the end of 2010, 190 models from 54 automakers had been listed in the catalogue of energy-saving and new energy vehicle promotion projects and the output of the 190 models totaled 7,181 last year. New energy vehicles refer to the three types of EVs: plug-in hybrids, pure electric and fuel cell vehicles. The country's 12th Five-Year Plan (2011-15) includes the EV industry as one of its strategic emerging industries, which are expected to become leading and pillar industries of the national economy. Soon the national standard for the EV industry will come out, a catalyst for EV makers. The government has also spared no efforts in promoting the use of EVs. Electric buses have been widely used at major events such as the 2008 Beijing Olympic Games and the World Expo 2011 in Shanghai. Currently, EVs are promoted in 25 cities nationwide. In June 2010, the Central Government announced a subsidy program in five cities to encourage private consumer purchases of electric cars. Local governments also provide preferential policies for purchases of EVs and invest heavily in charging facilities. All this is paving the way for the mass production and wide use of EVs in China, but the road could be a bumpy one. High prices and a lack of sufficient power charging stations have kept consumers away. Among the 10,000 EVs currently on the road, only about 1,000 were purchased for private use. Most importantly many consumers still doubt whether the EV technology is fully functional. That's what Chinese EV makers have to deal with if they want to be successful in the market. 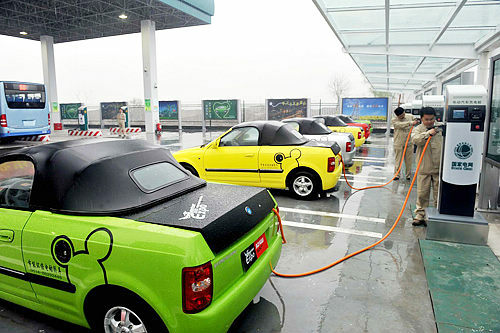 But this hasn't slowed down China's "going electric" trend. China's ambition has been shown in a development plan for new energy autos, which was submitted by the MIIT to the State Council earlier this year. The plan's goal is to have 500,000 EVs on the road by 2015 and 5 million by 2020. These goals, still awaiting State Council approval, will be a real challenge for China's burgeoning EV industry. But it at least shows China's resolution in becoming an environmentally friendly country.